M3 is honored to have a feature in World Vision’s blog, Voices. Dr. Paul Osteen, co-founder of M3 recalls the story of a patient he cared for on the banks of the Zambezi River at a small mission hospital in rural Zambia. Dr. Osteen has worked alongside World Vision for many years. We hope you’ll stop by their exhibit booth to find out all the ways they are helping meet needs all over the world and where you may fit into their organization. “I remember so vividly that she had no shoes on her feet, and her feet were calloused and scarred from her daily life of toil. Every crevice and ridge on the soles of her feet were darkly stained with soil. 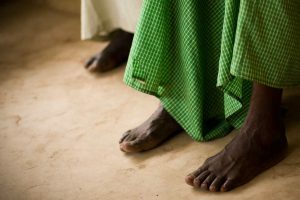 In the bright light, the contrast of her pale skin and the swirling dark patterns made her feet look beautiful — almost like a work of art.” Read the full story.